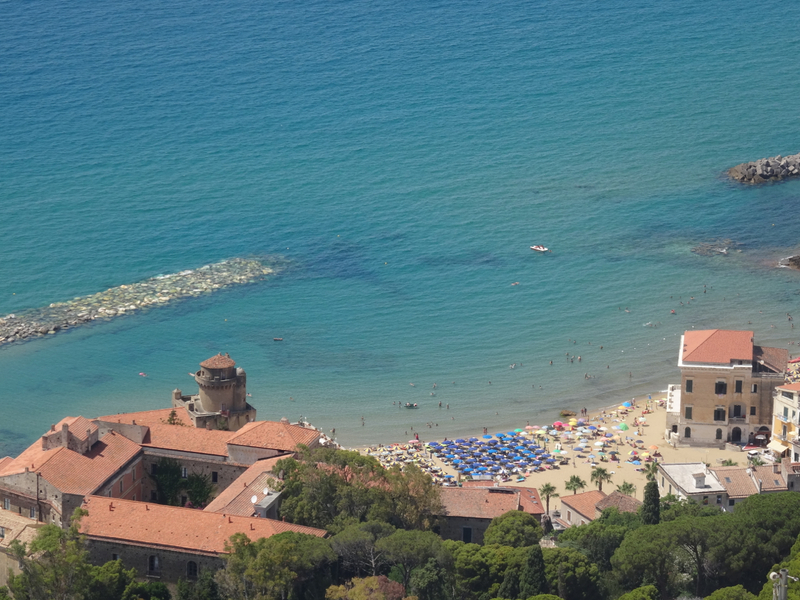 This cheerful ‘brace-yourself-for-Naples’ film is set in Castellabate, a hilltop town perched on one edge of the protected Parco Nazionale del Cilento, Vallo di Diano e Alburni. Our route there took us through the outskirts of Naples, past Vesuvius, and on beyond Paestum, famous for its mozzarella di bufala and the beautiful completeness of its Greek temples. Quite a route, and Castellabate was a fine full stop. The centre of the old town has two piazze. The first we reached was the one that features in the final credits of the film, Benvenuti al Sud. The square, more of a balcony really, has views over the sea and into a sky that drifts with occasional gulls and sounds from the beaches below. We, and a crowd of about four, stood and stared, and soaked up the colour. Old, narrow streets led us out of the piazza and further into the town. It was a hot midday but there was shade and many of the tight, tiny streets funnelled the wind. The second piazza we visited was the one in Benventi al Sud that played host to the post office. The film set is gone now and the space filled instead with cafes and umbrellas. 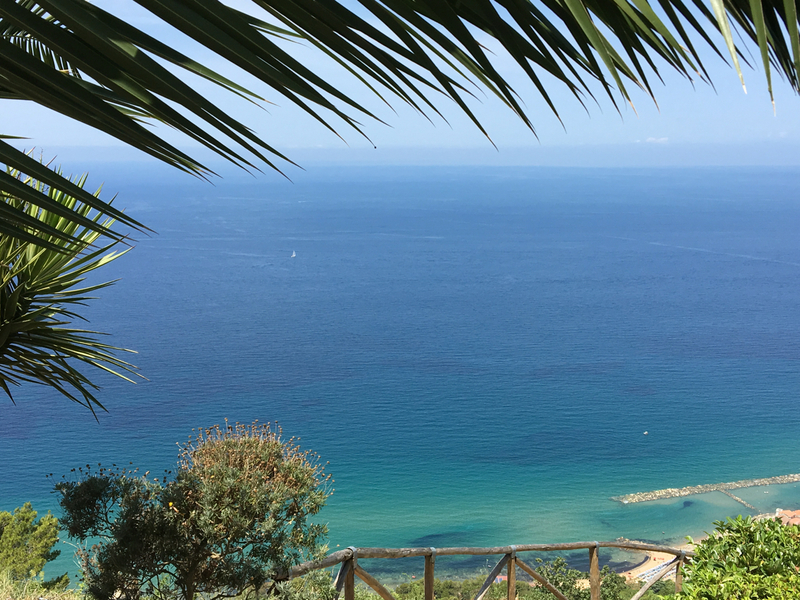 We flopped in their shade for a lunch of traditional Cilento dishes – acqua sale and a plate of local hams and cheeses. It was peaceful and perfect – a good place to end our first taste of Castellabate. 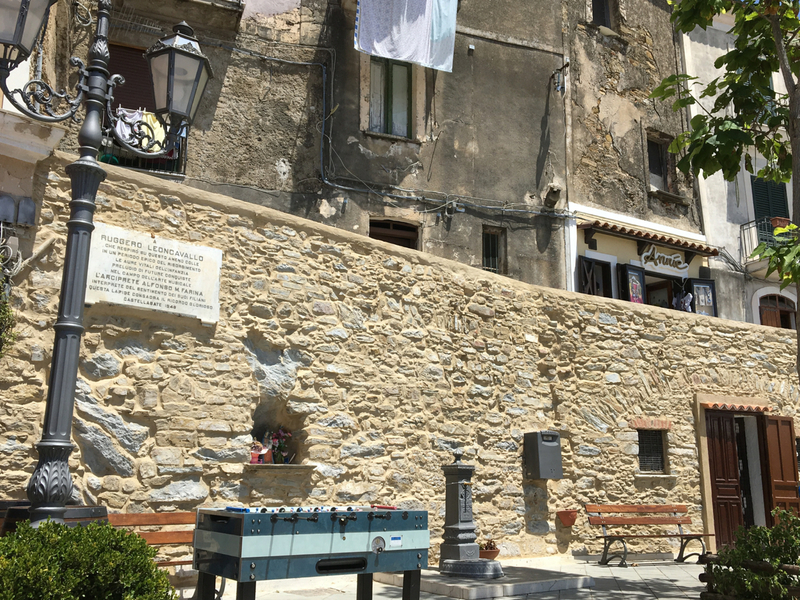 The football table – perhaps the one from ‘Benvenuti al Sud’ – which now stands where Maria unwrapped herself from a motorbike or two. 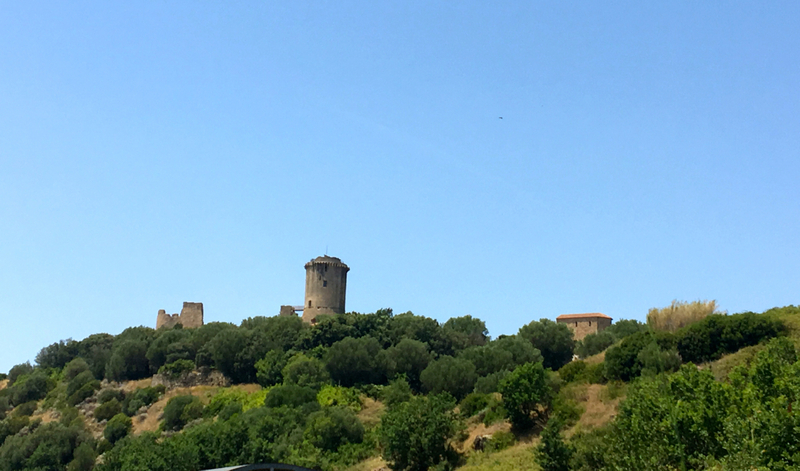 The next stage of our journey was to Roccagloriosa on the opposite edge of the national park. The autostrade we followed, with occasional loops for roadworks, seemed to hang within the wilderness that surrounded it. Gradually the unspoilt valleys on either side got deeper, the road stilts longer, and the warnings about ice more frequent. We had booked a night at Le Stalle di Giurò, an agriturismo in Roccagloriosa with space for us and the dog. 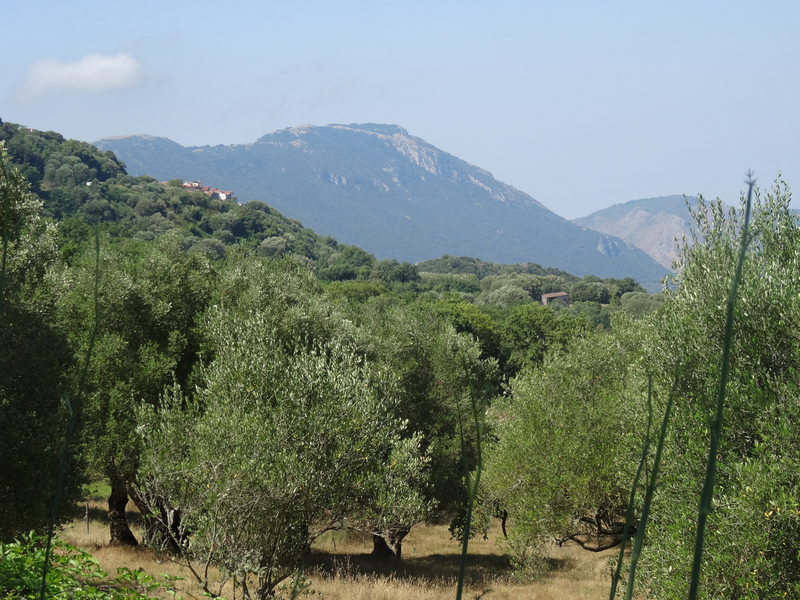 The area, once home to the feisty Lucanians who dominated a sizeable chunk of southern Italy in around 500BC, is all granite, trees and views – a healthily impenetrable place if you’re worried about your neighbours. It’s old and little-manicured, the sort of place that runs a finger down your spine (in a good way) the first time you visit … especially if your aged Alfa, with its rattled-loose undercarriage, is faced with dwindling roads. 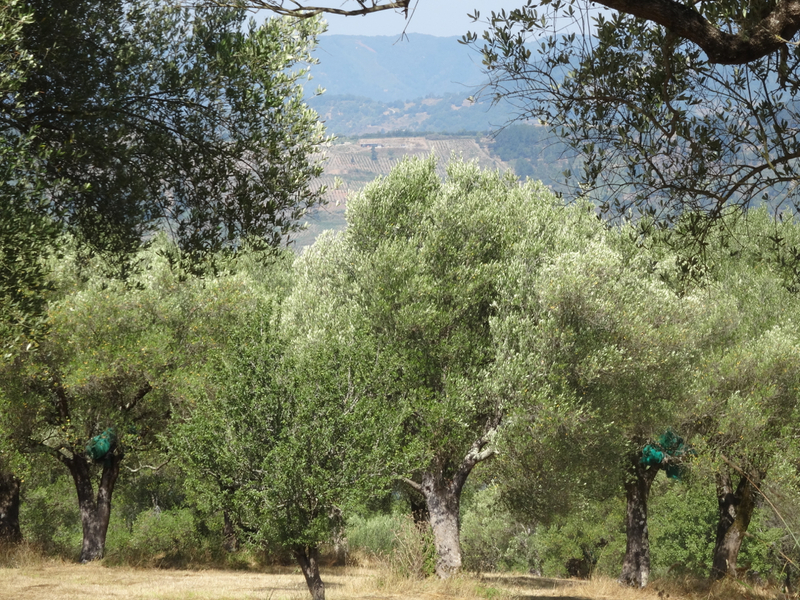 At first it was straightforward – a small tarmac road through olive groves – but then the tarmac disappeared, and rutted dirt led us deliberately off piste. It was so off-piste that it became hard to tell the clank of goat bells from the scrape of Alfa Romeo metal. 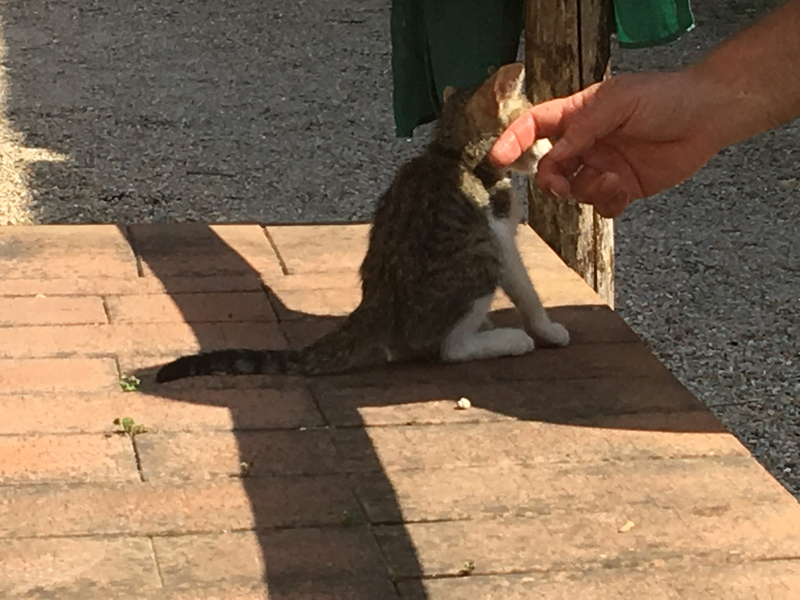 Then, at last, we were there … at the right spot in the middle of wild goatville, welcomed warmly by a half-blind kitten and the owners. Our rooms were comfortably rustic and clean, and the dog ecstatic about his wilderness walk in the 37 hectares of wood at the back of the property. Supper that night, after an edgy drive back up the road to the town, was at Il Borgo where we sat out in the piazza in front of the trattoria. As the dark moved in the tables around us filled up with local families. Slowly, slowly the heat soaked back into the sky, and the stars came out. Nobody hurried … it was too pleasant and too still. The meal over we strolled up along the cobbled streets towards the church with its views over the valley. It was close to midnight – cats watched and the elderly chatted in doorways. The next day after a breakfast of fresh cake, eggs, ripe tomatoes, bread and coffee we turned back along the stilted roads towards Napoli. 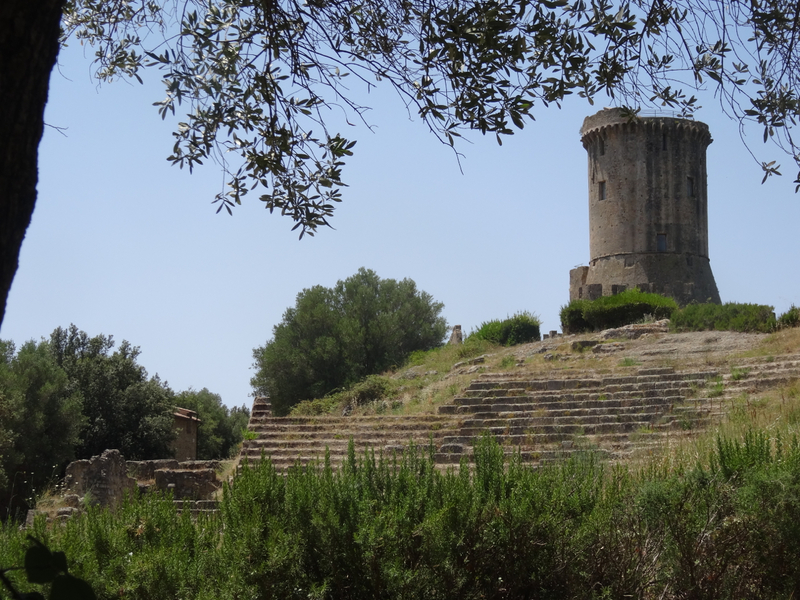 The plan was not to stop … but then the old site of Velia turned out to be right on our route home. We found it just as the sun reached the hottest part of the day. 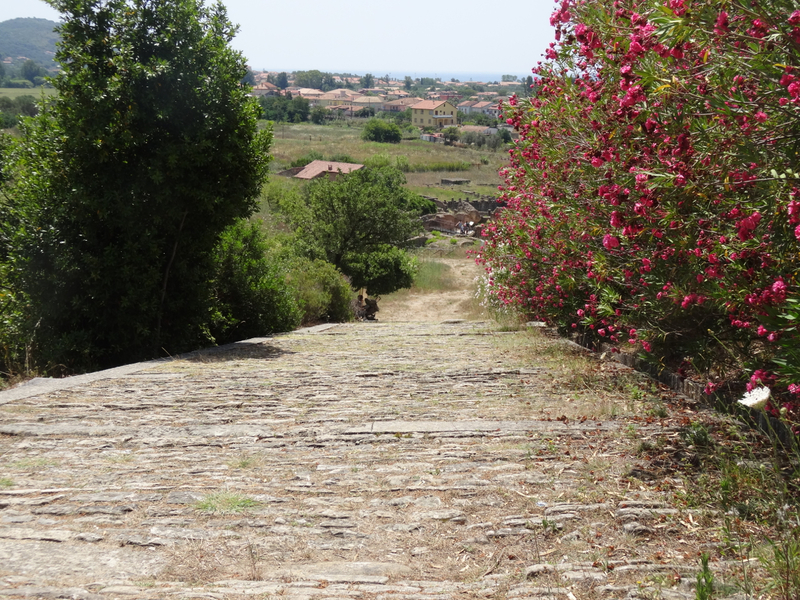 The Via di Porta Rosa at the archaeological site of Velia in Cilento, Italy. 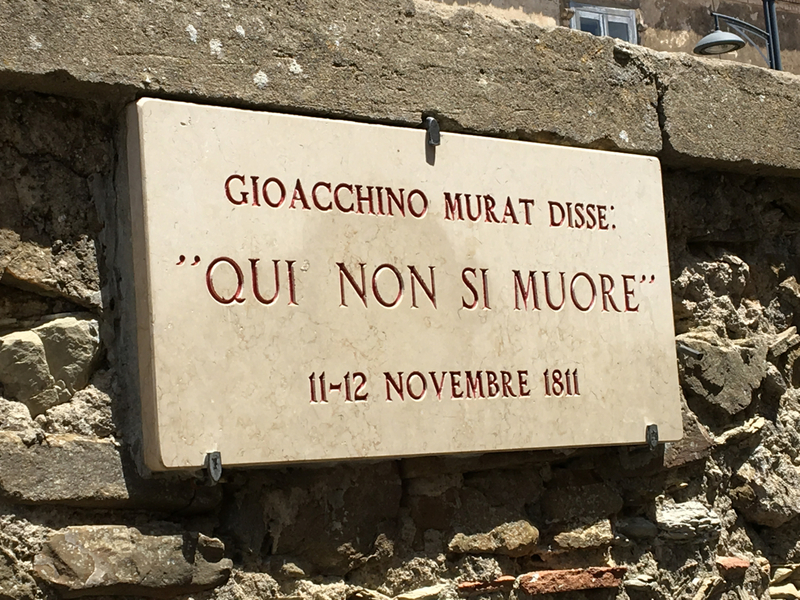 This leads up to the arch (Porta Rosa). The shade evaporated and the ruins stood unforgiving – one right at the top of the ridge above us. Full appreciation of archaeological sites takes a special skill … I’m normally in the ‘could-do-better’ group, a stranded alien in a hard-to-imagine world. But Velia is different. I can understand why a community would choose to live in Elea (as the Greeks called it)/Velia (as the Romans called it), and I love the work in the walls that remain. Crowning it all for me is the site’s beautiful Greek arch. It’s been named Porta Rosa, after the wife of the archaeologist who recently uncovered it. The arch sits in a gorge at the top of the hill exactly as it has done since the second half of the fourth century BC. The only difference today is that the debris that buried it for so many of those centuries has now been removed. 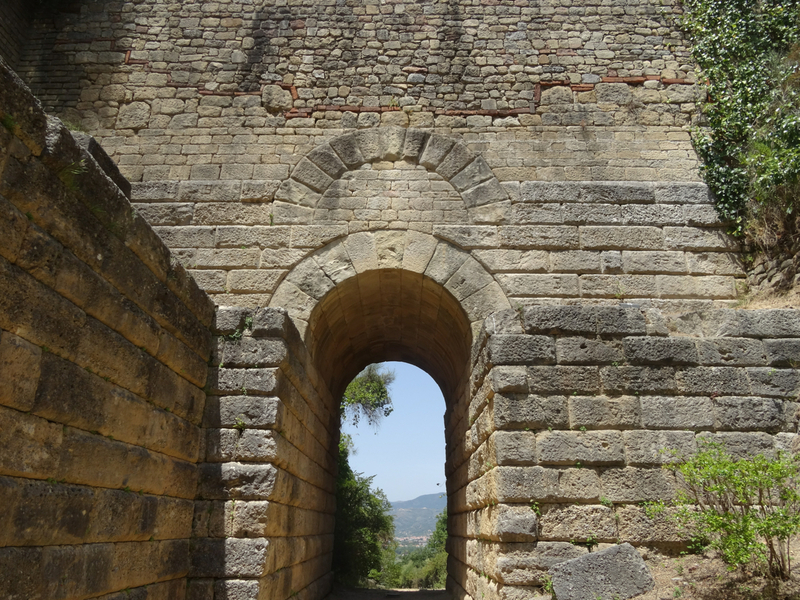 The Porta Rosa in the archaeological site of Velia in Cilento, Italy. It was built in the fourth century BC and buried soon afterwards by some form of landslide. It was only rediscovered in 1964. The rest of the site, a mix of Greek, Roman and medieval remains, is small and easy to access despite the climb and, on the day we visited, the heat. To help with both there are water fountains dotted strategically, most of which were working when we were there. There were other groups of visitors but there was never a crowd. Most of the time it was just us, working our way from shade to shade, civilisation to civilisation and view to view. 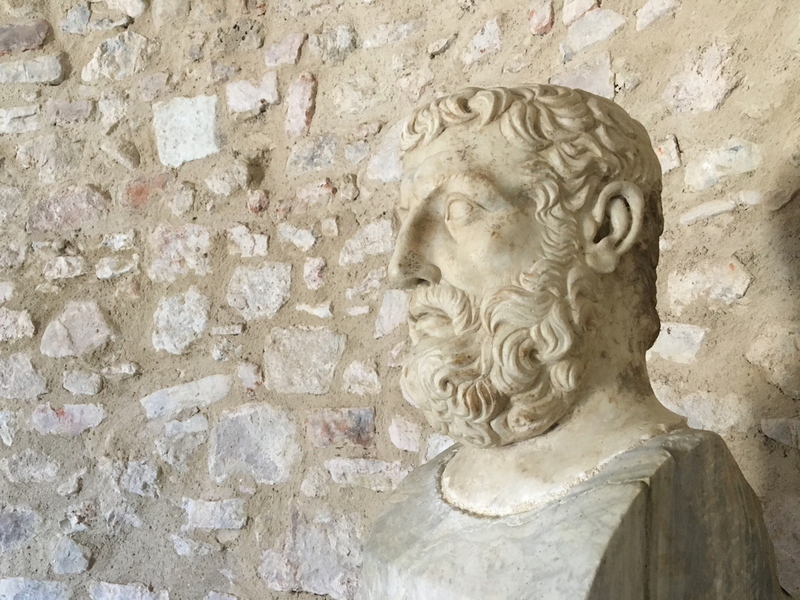 Up at the acropolis, right at the top in the shelter of a medieval building, we discovered one of ancient Greece’s most esteemed philosophers – Parmenides (who lived around 500 BC) – and we learned of another who also came from Elea, Parmenides’ pupil Zeno (490 – 435 BC). The display was clearly laid out and easy to understand, apart from the quotation above … but it seems it wasn’t just the heat, Parmenides was never one for making thinking easy. 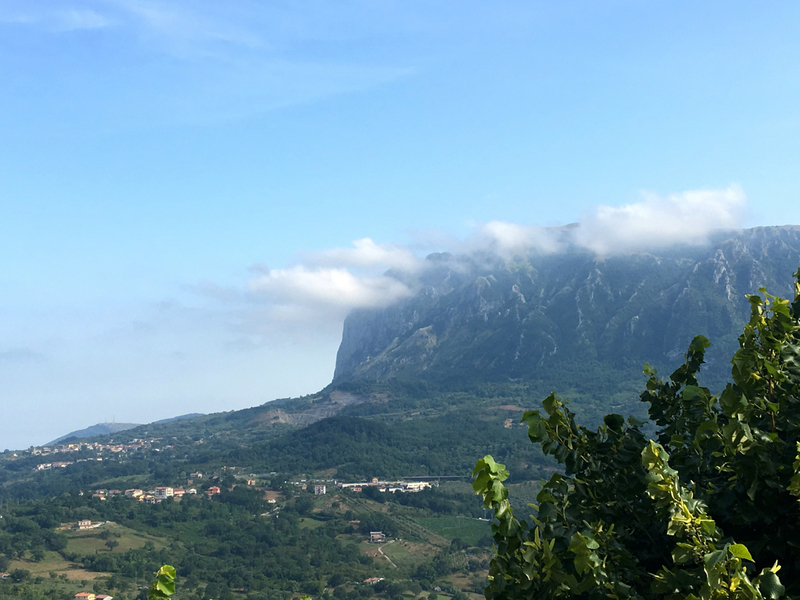 We abandoned the struggle and turned the car towards Napoli – heads full of Cilento, its light, its wild places and its people, ancient and modern. 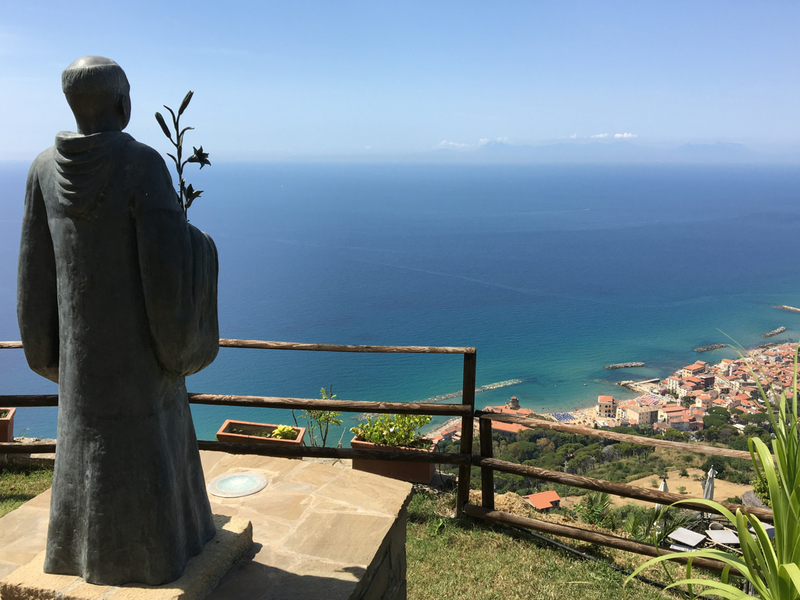 This link is in Italian and gives information on the religious founders of Castellabate. This is a recipe (also in Italian) for the casserole acqua e sale which is based around dried bread and tomatoes. Information on the Lucanians (in English) from Geoff Matthew’s website Life, Death and Miracles. 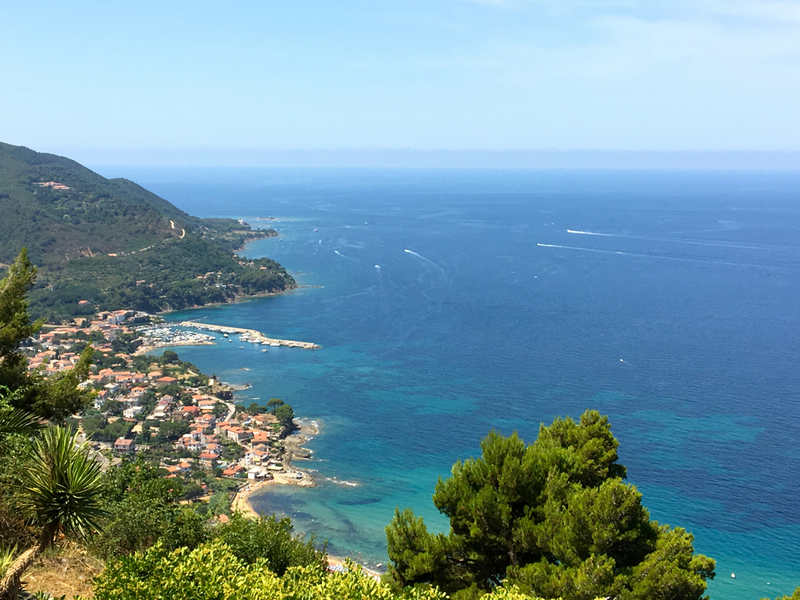 Finally … a glimpse of the irresistible Benvenuti al Sud. 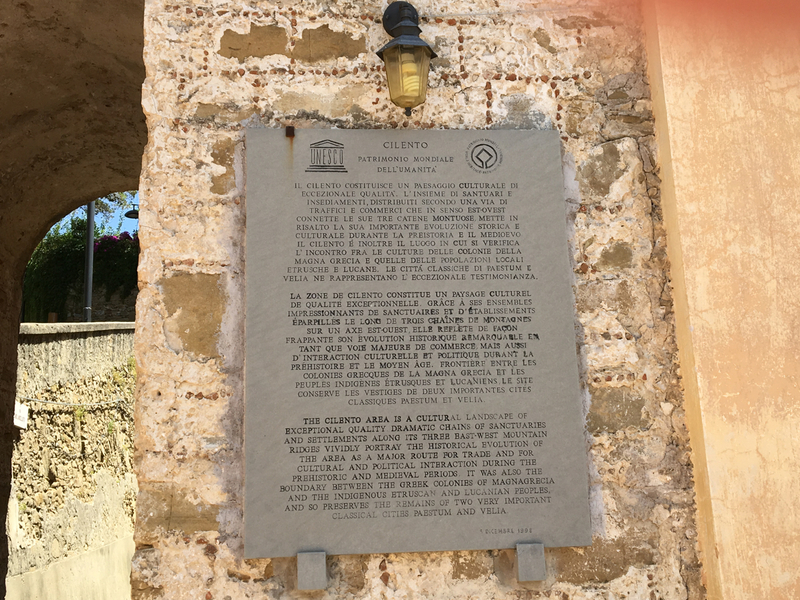 This entry was posted in Castellabate, Cilento, Italy, Velia and tagged Benvenuti al Sud, Castellabate, Cilento, Il Borgo, Italy, Le Stalle di Giurò, Parmenides, Roccagloriosa, Velia, Zeno. Bookmark the permalink. Hi Lyn – gorgeous is a great word for it! And…thank you for passing on that excellent news about the live sheep trade in Australia. So hope that the government can find the right way to bring it to an end. I hope to write a short blog post tomorrow passing on the news. Many thanks again for keeping me informed. I heard also that 2 companies exporting to the middle east have lost their licences to do so. Extraordinary. Diane and Cilento make up the name of now-deceased famous Australian actress Diane Cilento, feisty beauty of the blonde Greek kind and the first wife of Sean Connery. I must presume her roots are here. Such a place I would feel at home. Lovely post. So envious that you are based there and can explore on a whim 🙂 I researched the area prior to my last trip but found as you say that a car really is needed. Maybe one day i too can be in Italy longer and settle for a while! 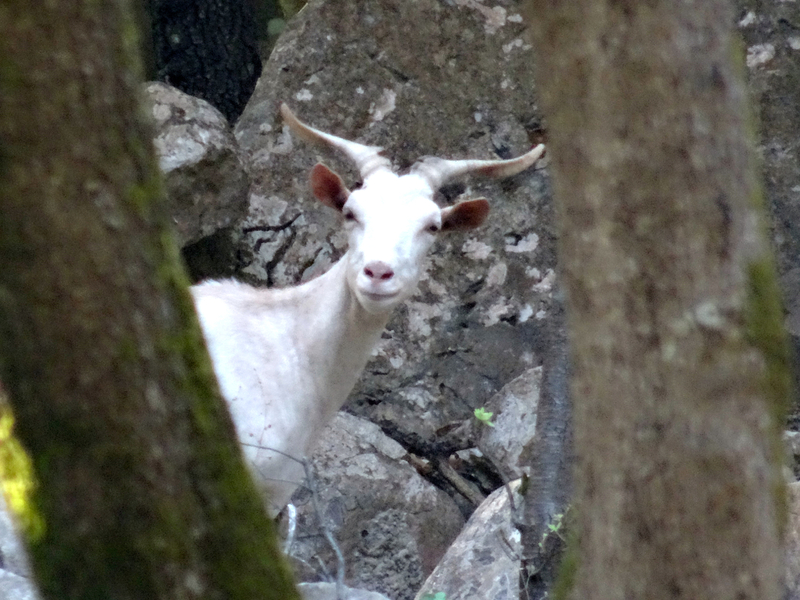 I adore the post and your photos and Mr Goat. Thanks so much – you’ve just given my day a big boost of sunshine ☀️😀 We are incredibly lucky to be here. It really is a huge privilege … and then I have the added happiness of sharing via my blog. If you can manage the time and a car I really don’t think you’ll regret it. So much to see and enjoy. Glad you like Mr Goat – he’s a favourite of mine! Ah, that’s better. Great photos. It looks wonderful. Don’t you think the Porta Rosa very like the one near you in Naples at …………. Damn. I can’t remember the name but you took us there and the great oracles cave was closed. Brain dead. It’s been very hot here amazingly. Hi Ginny – glad the photos have come through. The arch you’re thinking of is Arco Felice. We drove through that yesterday evening and it’s surprisingly different. Arco Felice is very tall and far more frail looking (in a very substantial way!) 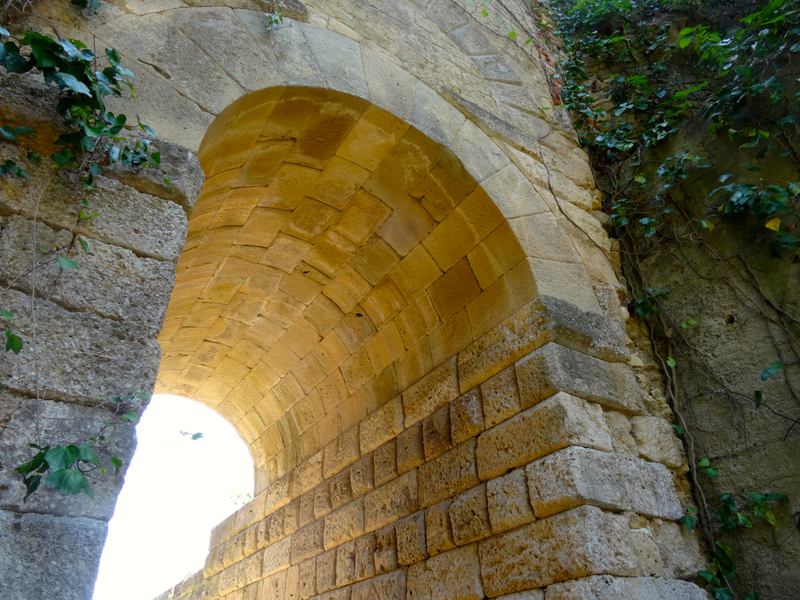 compared to the smaller, robust, solid arch of Porta Rosa which has big, regular stones whereas the arch in Arco Felice is made of small, on their side, Roman bricks and does not look so even. I’ll try to get a photo. 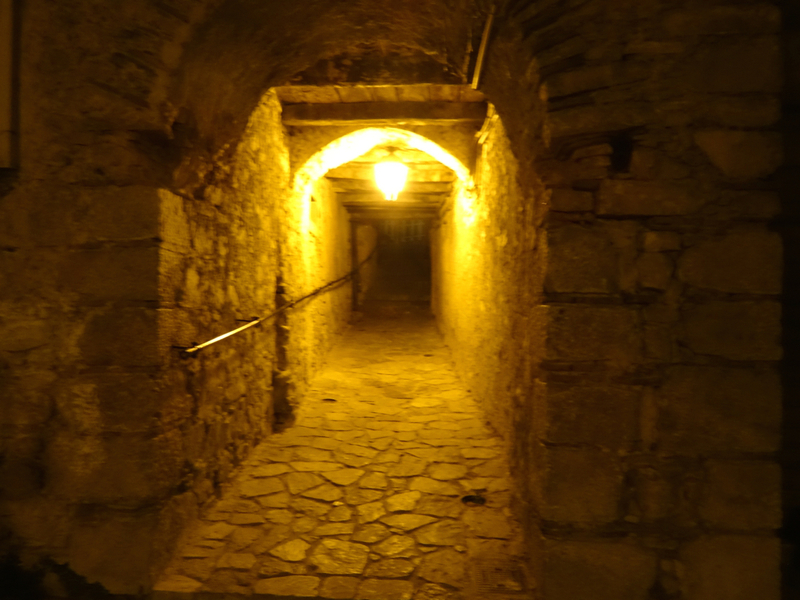 PS Good news – the Sibyl’s cave has opened again (finally)! We are very, very lucky Lyn. Hope you might be able to explore this part of Italy one day. You’ve just about convinced me that I should rent a car for my next tvisit to Campania. And, I must watch that movie again. This sounds gorgeous Georgie but very few of the photos seem to,have come through?? Hi Ginny – that sounds very annoying. Not sure where you are with your Ipad but it may be that they are just taking a while to download. I don’t think there should be a problem from this end. I wonder if you could try to access from a main computer and let me know if the problem is still there. If it is I’ll try to find out what’s going on.